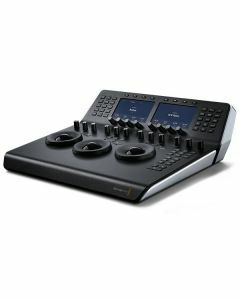 The Blackmagic Design DaVinci Resolve Mini Panel is a condensed panel filled with an extensive combination of features and controls. Like the micro panel, three professional trackballs are provided along with a variety of buttons for switching tools, adding colour correctors and navigating your node tree. Two colour LCD screens that display menus are also provided, along with controls and parameter settings for the selected tool and direct access buttons that let you go direct to the menus for specific DaVinci features. The Blackmagic Design DaVinci Resolve Mini Panel is ideal for editors and colourists that need to regularly switch between editing and colour grading, or freelance colourists in need of a panel easily transported between facilities. The mini panel is also well suited for colourists working on location shoots, for corporate and event videographers, houses of worship and more. To take your colour grading to the next creative level, the DaVinci Resolve Mini and Micro panels include 12 dedicated primary colour correction control knobs. These are designed to make it easy for you to stylise the look of your images and generate precise “film looks.” Every knob can be pressed to instantly reset the control, perfect for when you are experimenting with a new style but become a little lost in the process. Simply press the knobs to reset. Control the balance between the YRGB adjustments and Y only adjustments made using the Y channel lift, gamma and gain controls in the primaries palette or the un-ganged luma curve. Trackballs provide RGB balance adjustments for lift, gamma and gain, each with a master level control. The Advanced panel also features a dedicated RGB offset and master gain trackball to adjust the tint and brightness of the whole image. The trackballs can be set to work in either log or RGB with the touch of a button.